Mold or mildew in the home can be a real threat to people who suffer from allergies, but mold and mildew cleaners from Allergy Asthma Technology can help. You may already know some simple facts about mold and mildew. Both are forms of fungi that grow in damp places like basements or attics where moisture or humidity is not under control. These basic facts are important to consider, because basements and attics are sometimes places where children like to play, which means their health may be at even more at risk than the average family member, if mold and mildew are not detected or cleaned up soon after it appears. Mold spores are known allergens causing sneezing, runny nose, irritation of the eyes and other symptoms. In other words, molds can make life pretty miserable for anyone sensitive to its effects. You may notice these symptoms in your child however, and not make the connection between their condition and possible mold in your house. While fear of mold has abated somewhat over the years, the actuality of mold allergies is real. Some research has shown that certain forms of mold, especially Stachybotrys chartarum, a black mold, may even cause cancer. If you find mold of any form in your house, it is best to take immediate action. Allergy Free Cleaning Products can be vital to getting rid of mold and mildew in the home, and keeping it away. 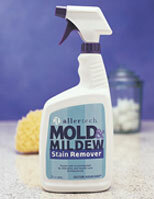 Allertech Mold and Mildew Stain Remover is an allergy-free cleaner that neutralizes mold and mildew, cleans it completely from any surface and gives you peace of mind. Most people do not know that mold can grow from the “top down” of the house as well as up from the basement. In all seasons, damp attic conditions can cause condensation that clings to wall and ceiling surfaces where mold can then grow. In those conditions mold may show up as dark stains in your ceiling. An attic fan with a humidity-reducing feature can help reduce the amount of humidity in attic spaces, but not always. Variations in temperature and outdoor humidity can be difficult to detect, which is why the AcuRite Temperature and Humidity Comfort Monitor can be vital to managing the air conditions of your home. You can get crucial feedback on the health of your air and possible conditions ripe for mold and mildew, wherever it occurs. At only $12.95, the AcuRite Comfort Monitor is affordable enough to put one in the basement the attic and the main living rooms of your home. But to be sure, there are other important steps you can take to combat mold and mildew in your home. 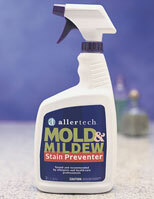 If you know the areas in your home most susceptible to mold and mildew formation, Allertech Mold and Mildew Stain Preventer gives you a protective shield against reoccurrence of mold in those “hot spots” for mold that are actually “wet spots” where condensation or frequent humidity problems occur. You know how it smells when spaces in your home get too wet. First there’s a musty, damp smell telling you some sort of fabric or home is soaked or damp. Mildew stinks. But mold and mildew can still grow without evident odor, and the symptoms of allergies caused by airborne spores from mold and mildew fungi may show up in your children or other family members before you know what’s causing it. There is particular risk to younger children, as asthma symptoms can be pronounced in the presence of certain molds, which can lead to tightening of the chest and trigger asthma attacks in the upper respiratory system. It is not always easy to diagnose symptoms related to mold allergies. But if your children or family experience chronic symptoms it is worth considering whether mold and mildew could indeed be the source of their allergies. The problem is usually curable. And that’s always good news.